I am inspired by those people that have taken the time to join the challenge, and I take comfort in knowing that there are many more people out there that have been doing these types of cleanups for years without posting the nasty fruits of their labor on social media. It is clear that we have a waste and trash and, in particular, a plastic pollution problem. But is the #trashtag going to solve these problems? It will not. Do we need dedicated people to volunteer their time to clean up the messes that are already out there? Yes. 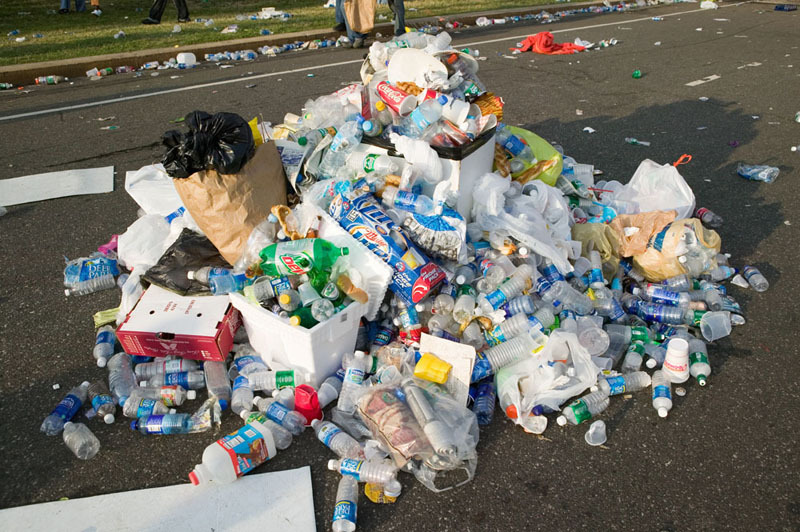 Do we need people to recycle properly? Yes. Do we need people to be more mindful about both what and how much they consume? Also yes. The #trashtag challenge has been great on elevating the discussions around these things. But this will not be enough. These are what we call end-of-pipe solutions (in that they all happen at the end of a product’s useful life) and rely on individuals to engage in the correct behaviors. But often times, knowing what to put in our recycling bin and what to leave out is confusing (case in point: almost every single-use plastic bag tells us to “save the planet: recycle this bag”, yet almost no curbside recycling program in the country accepts them). We volunteer our time picking up litter when our time could be spent otherwise. We get strange looks and “are you sure?” when we tell cashiers that we do not need a checkout bag to take one or two small purchases out of a store. So the problem is not litter. It is not people that don’t recycle right. It is not the cashier that instinctively double-bags a half gallon of milk. No, these are not problems. They are symptoms of the problem. For decades we have been conditioned to accept an overpackaged, plastic-filled lifestyle of convenience. Manufacturers and brandowners have convinced us that consumption is good and that most of the stuff we consume should come packaged in a neat plastic shell. They continue to pump more and more products out into the economy without any responsibility for what happens to those products or the packaging they come in once they have been sold. THIS is the problem. And even as the focus on plastic pollution has increased globally in recent years, plastic production is actually forecasted to triple by 2050. As efforts to fight climate change have ramped up, profits for oil and gas companies have been put at risk, so the industry has been forced to come up with ideas for turning their extractive raw materials into a product to be peddled and they have set their sights on plastics. We cannot recycle, landfill, or beach-cleanup our way out of this problem, especially if the petrochemical industry is planning to completely inundate us with their wares. We can only solve it by stopping it at its source, by stopping it from ever entering the economy and wastestream in the first place. And this can only happen if our local, state, and federal governments pass laws to force industry to reduce the waste they create and to pay for the responsible management of their products at the end of their usable lives. Talk to your favorite restaurant, coffee shop, food truck, or watering hole and ask that they join Clean Water Action's ReThink Disposable program to take steps to reduce the amount of single-use plastics that they give out to customers. Educate your friends and family about the issue (share our blog post!). We have been conditioned to think that if we are recycling, we are doing our part in saving the planet. Yes, it’s important, but this mindset only perpetuates the systemic waste problems we face. Most importantly: demand action from lawmakers. Write or call your local, state, and federal elected officials. Let them know that you are concerned about the amount of plastic pollution you encounter every day. Email them the pictures of your #trashtag challenge results. Then email them pictures again when the spot in your neighborhood that you cleaned up inevitably becomes strewn with litter once again. Reach out to local groups leading on this issue and ask how you can help. Show up for legislative hearings and testify in support of efforts to reduce plastic pollution. It will be hard, but it’s not impossible. The #trashtag challenge has shown that lots of people are willing to take action this issue. Let’s keep going. Let’s stop plastic pollution at its source and #RethinkDisposable once and for all. For more information on our ReThink Disposable program, contact jberard@cleanwater.org.